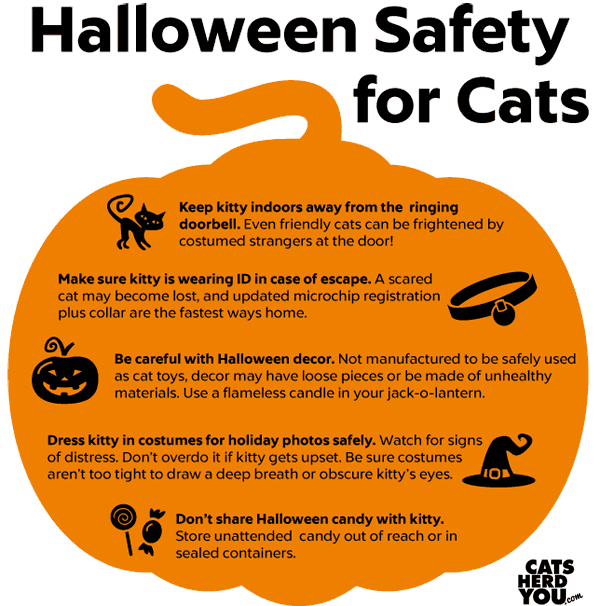 Whether you are planning on trick-or-treating for the holiday or having a party with friends, take a few extra minutes to plan for your cat’s safety for Halloween. Got Leftover Veterinary Drugs? Safely Dispose of Them Saturday! We’re bringing back a post from last year because it’s relevant again now. The National Prescription Drug Take-Back Day is coming this weekend, and we want to be sure you’re ready. So dig out those leftover pills you could never get into your hard to pill cat. 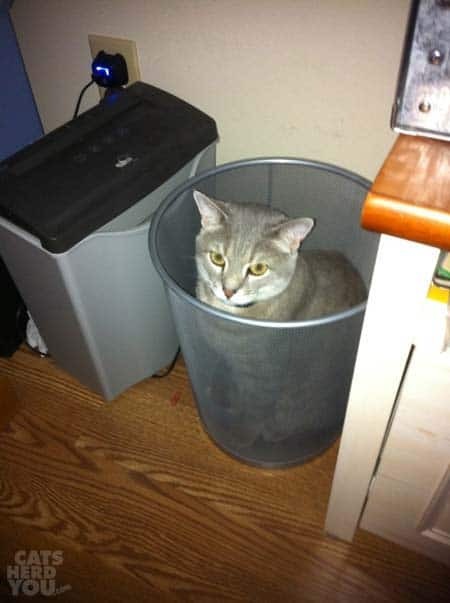 There’s a safe way to dispose of them near you! You can find locations that will be accepting prescription drugs, no questions asked, on Saturday, September 26th by checking the National Take Back Initiative Collection Site Search or by calling 1-800-882-9539. There are a lot of things you shouldn’t just throw away. Flushing your unused medications down the toilet or drain is a bad idea. The US Geological Survey has already found levels of drugs such as antibiotics, hormones, and contraceptives in 80% of the rivers and streams tested in part of a nationwide study. Additional studies have shown that fish and other wildlife can be adversely affected by medications, even when the medications are expired. Call your city or county government’s household trash and recycling service to ask whether a drug take-back program is available in your community. Some counties hold periodic household hazardous waste collection days, where over-the-counter and prescription drugs are accepted at a set location. Ask your pharmacist whether he or she knows of any medicine disposal programs in your area. Find a local, independent pharmacy in your area who participates in drug disposal through disposemymeds.com. Check the U.S. Drug Enforcement Administration’s web site for National Prescription Drug Take-Back Event information. Ask your veterinarian. They may be willing to include unused medications originally purchased through them in shipments to their medical waste company. If there aren’t any drug take-back events in your area, you can purchase special postage-paid packages from your local pharmacy that send medications back to a medical waste company. Some medications are ineligible for this program so read the fine print before you purchase. The same guidelines can be used for disposal of human medications, though your veterinarian is unlikely to be willing to take back unused human medication. Keeping our groundwater safe is everybody’s responsibility! A survey conducted by Lake Research Partners and commissioned by the ASPCA reveals that more than one-third (35 percent) of cat and dog owners don’t have a disaster preparedness plan in place. Do you have a plan? If not, now is a great time to work on one. September is National Preparedness Month, when FEMA encourages citizens to take action by making an emergency plan with their families and their pets. If you do need to evacuate due to disaster, where will you go? 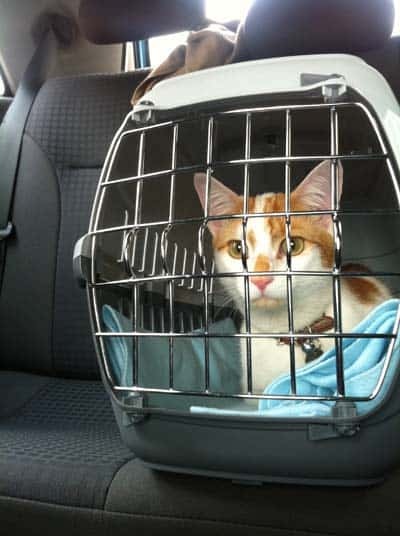 Check with your local emergency management agency to see if your local evacuation centers make provisions for pets. 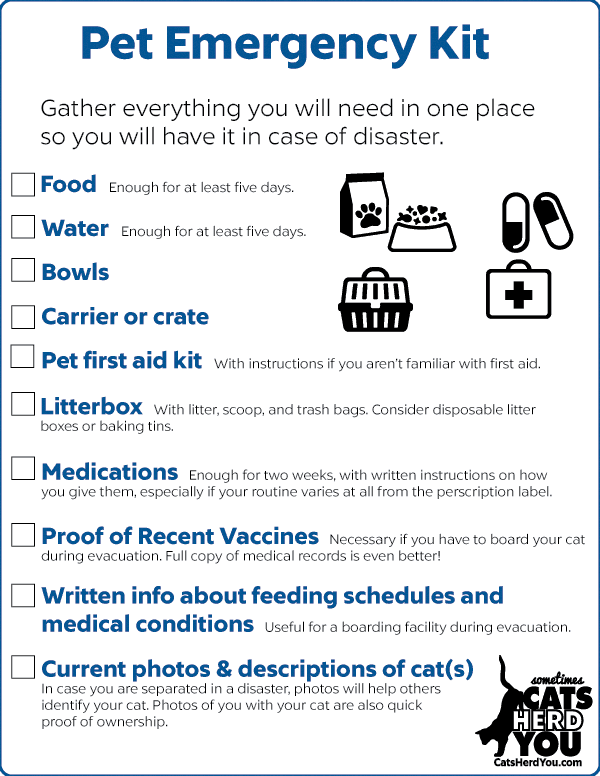 If you need to leave your home in case of disaster, can you and your cat visit a friend or family member in another state? You can even be each other’s evacuation plan! Keep in mind that if you need to go to a hotel or motel, many aren’t pet friendly. You can check on options at Go Pet Friendly so that you have an idea of places that might accept your four-legged family members. Eight in ten internet users look online for health information. When it comes to advice about your cat’s health, you’re looking for reputable sources of information. How can you tell the difference between good and bad information about your cat’s health online? Going straight to the scientific sources is a way of getting information about your cat’s health without risking someone adding non-evidence-based information to their articles about it. One of the best sources for veterinary journal articles is PubMed, from the US National Library of Medicine at the National Institutes of Health. When you read full veterinary journal articles, they’re heavy reading, but can provide valuable information you don’t see anywhere else. In addition to the PubMed, which is a US federal web site, large professional organizations and well-known medical schools are also good sources of feline health information. Look for the site to be a .org (organization) rather than a .com (commercial) site. There are plenty more, but those give you the idea. Look for a .edu on the site’s URL, which indicates it is an educational institution. This category of web sites includes everything from well-informed individuals writing for sites, well-intended individuals writing about things they really don’t have enough information about, and quacks. You need to use some critical thinking when approaching web sites in order to decide which is which. The site you’re reading now actually falls under the category of unreviewed sources of unknown credibility. I’m not a veterinarian or a behaviorist, and I write pieces for Topical Thursdays that might be considered giving advice. How would you decide whether this site or any others are well-informed or might contain non-evidence-based information? One of the first things to look for when looking for a credibility is determining the source of the information published. What is the primary source? The primary source of the information may be the site’s author himself. If this is the case, what are the author’s credentials to give this health advice? There should be an About page or something of the type giving information that you can use to determine whether you want to trust the advice of the author. The primary source may be a medical study. Look for information about the name of the study or the author so that you can refer directly to the study for additional details. You might find that studies cited are a dozen or more years old. Does that change your opinion of whether you want to take the advice from this web site? The primary source may be quoted in the article. If that’s the case, there should be some brief mention of the source’s credentials so that you can decide whether they are a trustworthy source of advice for your cat. You can even search for other information about the person quoted to see how authoritative they are on the subject. The primary source of the information may be another web site. If that’s the case, what is that site’s primary source? You can use the same steps above to decide on whether this site is a trustworthy source of information to provide data to the site where you originally got the advice. You can’t always trust your instincts. Part of what some people don’t understand about cats when researching their health is that they don’t work like miniature humans. For instance, cats do not produce amylase, the enzyme that helps break down carbohydrates in food, in their saliva the way that humans do. Advice to eat lots of vegetables makes sense to you because you are accustomed to advice for human health, but it isn’t appropriate for your cat. It’s not all in slick design. A great-looking web site may have unsubstantiated information and a site without bells and whistles may include only evidence-based information. Consider how timely the information is. Veterinary science, like human medical science, keeps learning. Some information and studies from five or ten years ago may have been updated with new information. What’s the web site’s agenda? Are they trying to sell you a product, and if so is their information biased to convince you to buy? 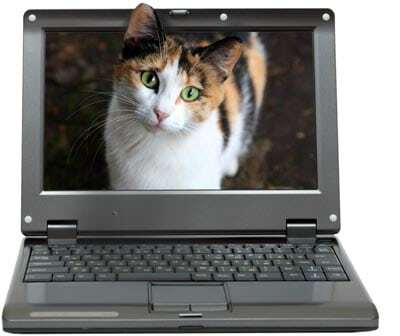 Use some critical thinking while you’re surfing the web for information about your cat’s health to ensure you get the best information to make good decisions for your four-footed friend. National Institute on Aging, Online Health Information: Can You Trust It?